At the UN, the International Humanist and Ethical Union (IHEU) and Atheist Republic have highlighted the grave situation for atheists in Malaysia, where government ministers are essentially calling for a witch hunt against members of the Kuala Lumpur chapter of Atheist Republic. 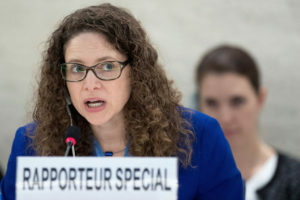 The statement, supported by Atheist Republic, was delivered by IHEU director of advocacy, Elizabeth O’Casey, to the UN Human Rights Council yesterday. The Human Rights Council is the body responsible for promoting an protecting human rights around the world. It was the first IHEU statement to the 36th session of the Council. This photograph of an atheist meet-up group in Kuala Lumpur went viral, prompting death threats from members of the public and threats of prosecution by police and officials. (Faces have been obscured in this image to protect those under threat.) IHEU consistently defends the right of non-religious people to peacefully assemble and associate. 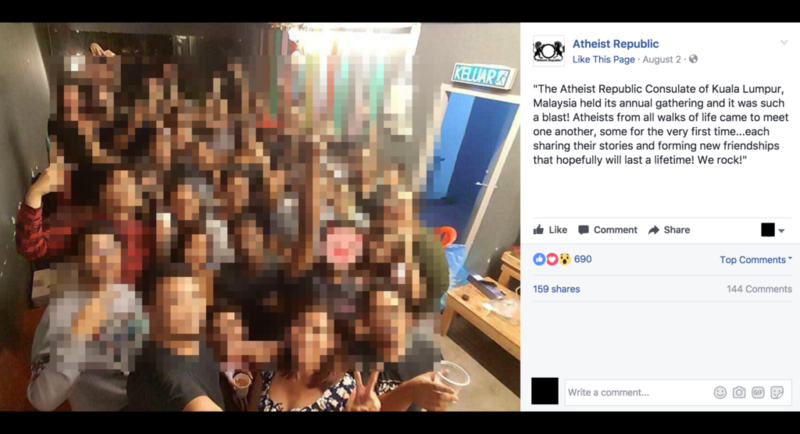 Last month, a Malaysian government minister said authorities would investigate a local atheist meet-up group after a picture from their meeting in Kuala Lumpur went viral. The groups also received threats from antagonistic social media users, angry that so-called “apostates” from Islam may be involved in the group. Describing the government fueled hate against atheists, secularists and humanists as a “witch hunt”, O’Casey also referenced Prime Minister Razak’s comments a few years ago when he described humanism and secularism as threats to Islam and the state, and labeled human rights based on secularism, humanism and liberalism as “deviationist”. Armin Navabi, the founder of Atheist Republic, commented, “Atheists are one of the world’s most persecuted minorities, and yet they are also one of the least defended. Atheists need to know that their countries care for and welcome them and that they are not ignored by the international community when they are being hunted down by their governments. The UN Special Rapporteur in the field of Cultural Rights, Dr Karima Bennoune, recently made an official visit to Malaysia. During her preliminary observations after her trip, Dr Bennoune condemned the reported statement by the deputy minister charged with Religious Affairs that those involved in a recent gathering of atheists should be investigated. This statement is supported by Atheist Republic. The minister was talking about Malaysian citizens who came together as part of the Kuala Lumpur chapter of Atheist Republic and posted a photo of themselves on social media. The idea that atheists should be “hunted down” by the authorities with the help of the public is essentially a mandate for a witch hunt, with all the human rights implications and risks to individual safety and security that this implies. Another minister, Asyraf Wajdi Dusuki, instructed the Federal Territories Islamic Religious Department to investigate the group to see if any Muslims were involved; he said that ex-Muslims found to be part of the gathering would be counselled, and anyone found spreading atheist ideas potentially prosecuted. Advocating secularism means supporting a system where freedom of religion or belief and expression for all is respected. Humanists defend human rights and promote values grounded in a concern for all people over that of ideology or dogma. If doing these things is “deviant” then we’re proud to be “deviationists” and stand by all those in Malaysia who are doing the same thing.